The last two days have been spent banishing the blues. 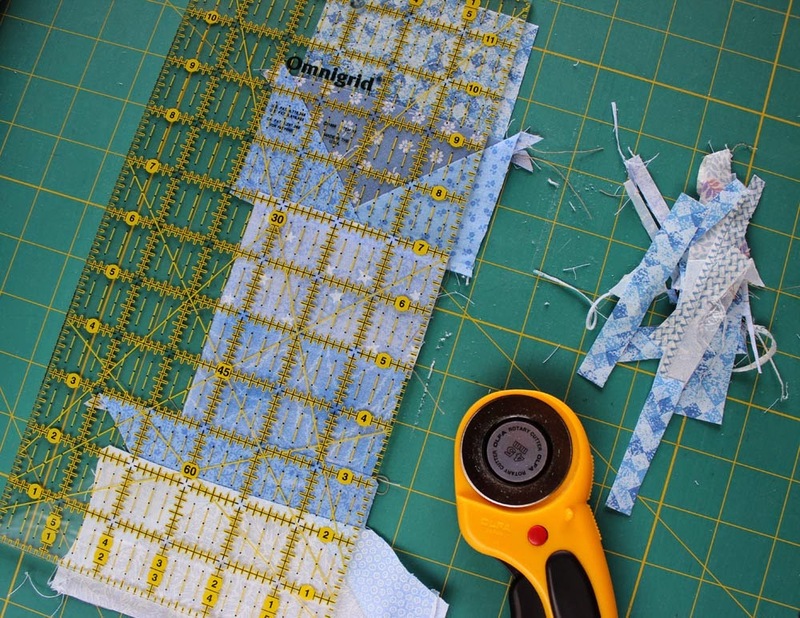 No, this is not a post on how quilting can help alleviate depression! Instead, it's about using up the blue scraps. 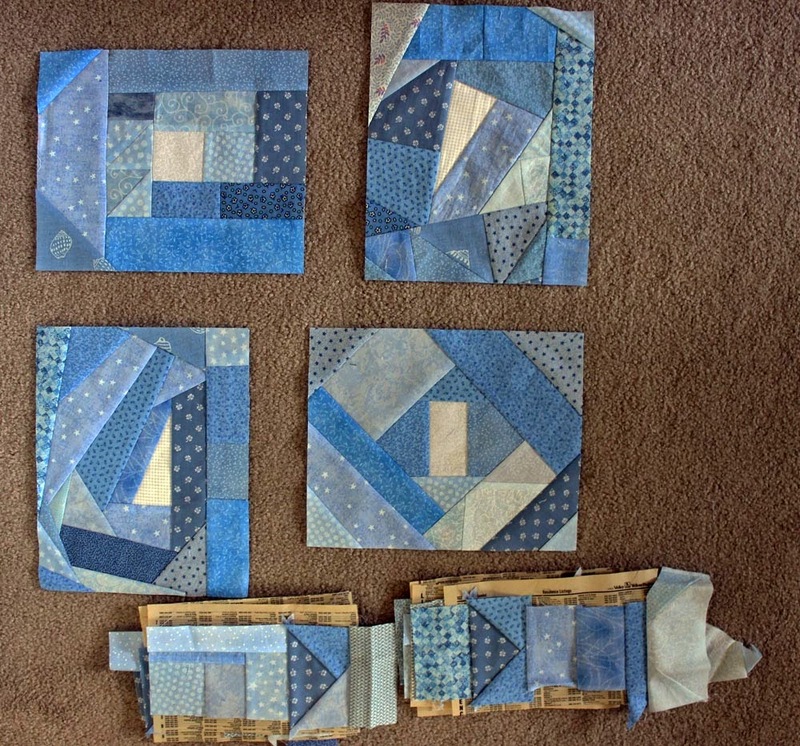 Specifically, the light blue scraps. Now, keep in mind, this is still a work in progress, as I need some blocks for the corners. Had to take this picture on the floor, as the design wall still has Sunny Lanes on it. But this is the block placement I'm thinking of. See what I mean by it needing some corner blocks? I got on a bit of a role from making the 15 1/2" blocks for my small group, and thought I'd do some more. Pulling out all the light blue scraps, I did the stitch and flip method again on phone book paper. The piles of narrow blocks at the bottom of this picture shows them still with the paper, and needing trimming. Those will be cut down to 3 1/2" by either 8 1/2" or 10 1/2", so that they fit with the four rectangle blocks, which measure 8 1/2" x 10 1/2". 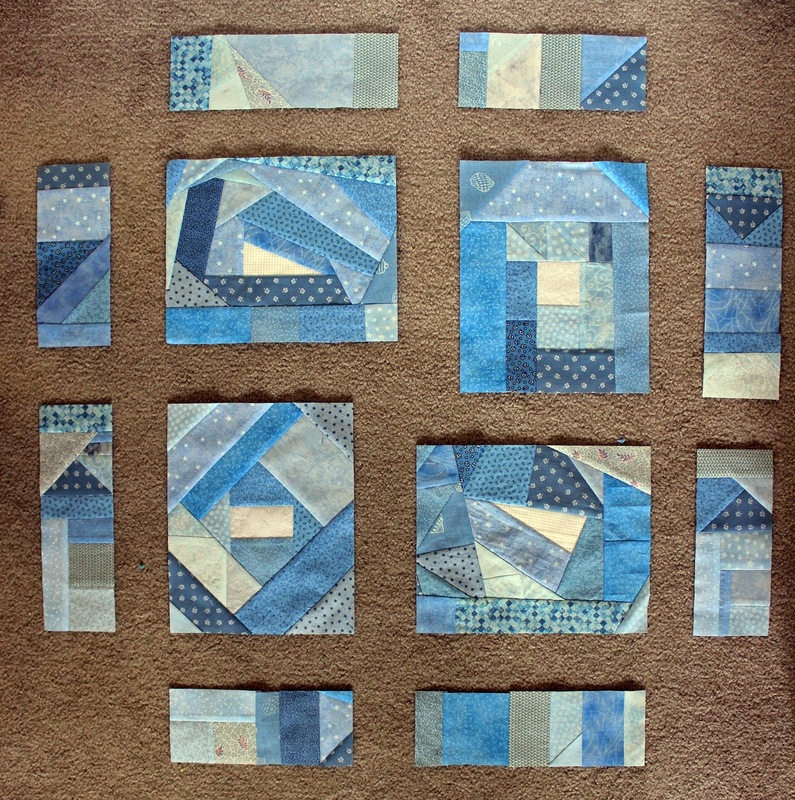 The 3 1/2" width was just because I had several blue pieces in which that was the longest side. This is another one of those random let's-see-what-we-have-to-use tops. It's a process that's seems to work for me (see Random Acts of Blue). Still haven't decided what the sashing color will be. White? Done that. Medium blue? Maybe. Dark Blue? Yellow? Any ideas?? Keep in mind that this will ultimately be a baby quilt. And hopefully I won't fall in love with it and keep it! Yellow always makes blue look so good. Audition time!! !